It doesn't take a perfect person to find a perfect love. 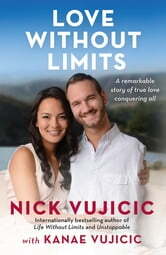 Even though he was born without arms or legs, Nick Vujicic created a 'ridiculously good life' for himself. But after dating disappointments and a long-term relationship that ended in heartbreak, he reached his mid- twenties worried that he would never find a woman to love and share his life. Then Nick met Kanae, and everything changed. But even with undeniable chemistry, they would have to navigate twists and turns worthy of a romantic comedy before becoming 'one' in marriage. In Love Without Limits Nick and Kanae tell how they improbably found each other, fell in love and then fought to overcome scepticism from others about their relationship. Filled with practical insights that will benefit any couple, this inspiring book describes a godly courtship and the early years of the Vujicics' marriage and parenting journey. Above all, Love Without Limits is an inspiring reminder that when faith is at the centre of a relationship - even one with serious challenges - true love will triumph.